Photo by Jenny Kirk Holy Redeemer School teacher Dana Peterson and third-grade students pose with a banner of the bracket for the Read to the Final Four contest they have been excelling in and recently advanced to the next round in. MARSHALL — Holy Redeemer School third-graders were thrilled when they recently found out they had qualified for the first round of Read to the Final Four which is similar to the March Madness-style competition. “I think it’s kind of fun,” third grader Liam Beyer said about advancing as one of the state’s top-reading classes. 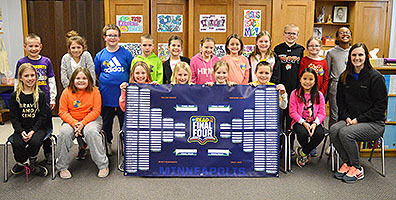 The Minneapolis Final Four Local Organizing Committee (MLOC) and the NCCA teamed up to offer Minnesota third-grade students the opportunity to take part in Read to the Final Four — a year-long statewide reading initiative that promotes and inspires reading for young people. The program is tied to the 2019 NCAA Final Four that will be taking place in Minneapolis in April. A total of 275 schools participated in the reading contest, with more than 3.9 million minutes of reading recorded to date. Holy Redeemer School qualified among the top finishers for the Round of 68. Mensink said he liked reading sports books, especially ones involving basketball. Third-grader Peyton DeMuth shared that she also likes reading. DeMuth said she thinks it’s “really cool” that she and her fellow third-grade students are among the top reading classes in the state. She added that she’s optimistic that they can continue advancing to the next rounds of competition. “I’m going to keep on reading,” DeMuth said. 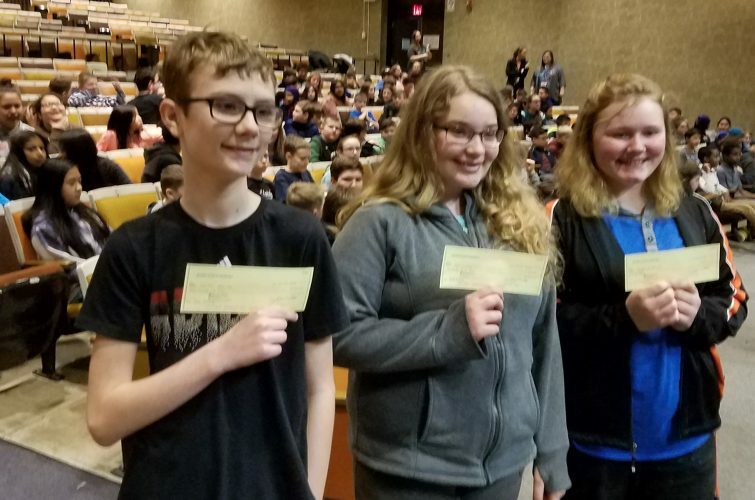 Holy Redeemer School finished the first round as one of the top classes in the Great Lakes Region for the Read to the Final Four contest. The three other regions include: Rolling Prairie, Northern Lights and Mighty Mississippi. The first round ended on Sunday, Jan. 27, but the third graders didn’t officially learn they had advanced to the next round until Thursday because dangerous weather conditions forced school to be canceled for three straight days. Peterson said HRS Principal Josh Langseth was the one who learned about the reading contest and shared the information with her. Peterson said the third-grade students just started Accelerated Reader this year, so the compatibility is another benefit. Read to the Final Four participants receive free access to more than 5,800 digital books. Sunday is the cut-off for the Round of 68. The lowest-scoring school from each of the regions will be dropped, while the other 16 in each region will advance to the Round of 64. The Round of 64 ends Feb. 17, followed by the Round of 32 (Feb. 24), Sweet Sixteen (March 3), Elite Eight (March 10) and Final Four (March 17). The MLOC anticipates identifying a champion on Monday, March 18.